I am looking for reccomendations for a silent UPS, I have a few C&N UPS's at work and they buzz. I cant live with a UPS at home that buzzes, whines, etc etc I dont even want one that has a fan in it if I can help it, please list me DONT's as well as Do's. A couple of DO's and DONT's via these forums. APC Smart UPS 750 (SUA750I) - see the unknown section below for the XL Model. APC Back-UPS RS 800VA (UK 230v version owned and tested by me, more details in my post below - keep 3+ft away and its OK). APC Back-UPS RS 1500VA (has a fan but it only runs when its running on battery - silent on mains). APC Back-Ups XS900 (fan runs all of the time). APC Smart-UPS 1500VA - Some people report this unit to have an always on fan, some say its silent/near silent. I will update this information as I get more information, it is possible that this unit is borderline due to heat or AC input voltage. I would suggest avoiding this unit at the moment. SmartUPS 750 XL (SUA750XLI) - The XL model's battery lasts 3x/4x longer, but at this time we dont know whether its a noisy beast, or just as quiet as the (SUA750I) - thanks to RPSGC. The power draw of my server varies a little, but spends 90% of it time between 117W and 121W with the most common number being 119W, my 800VA unit will keep my server up for a long time (the APC Powerchute software says 40mins). I will update the above list so that everyone can see what is and is not noisy in the UPS world. Last edited by andyb on Sat Jan 09, 2010 6:16 pm, edited 14 times in total. I have had another power outage some time during the night, and the power is still not on (at least 4 hours so far). I am not looking for a UPS that can last out for that long, far from it - a few minutes will do. What I dont want is to buy a UPS that makes an annoying noise (any noise), and then have to buy another and another etc. Please add your suggestions. I am currently looking at an APC Back-Ups RS 800VA 230V (AKA BR800I), its battery back up time will be fine for my needs and its only Â£90 including Tax. It is in the same range as a recommended UPS which is good, as the SPCR'er in question states that it is silent in general use, and its fan only runs when it is using the battery. The bad news is that it has a fan, and the UK version may be different from the US version (different AC voltage), also I found a product manual for the RS and the XS, which is a non-recommended product which would suggest that there is not a huge amount of difference between the two models. Ordered, I will let you all know if its noisy tomorrow. I would be amazed if there were any problems, the vast majority of PSU's use Active PFC now, (I would guess 80+%). I will let you know if I have any problems at all. UPS's must work with APFC PS. APFC is mandated in Europe. Correct? I use an APC Back-UPS ES 350VA and never had any problem with active PFC power supplies. Then again, I rarely run my PC off it for extended periods of time (especially considering I can only get about five minutes battery life out of it). I mainly got it for power spikes and brief losses, it's such a pain to lose all of your work because the power went out for a split second. As far as noise goes, it's silent (to my ears, at least) when charging and not running on battery. However, when running on battery power it does buzz slightly. It's not anything obtrusive, though, you have to get within a foot or two of the unit to really hear it. My UPS makes a horrible electrical buzzing noise that seems quite loud when up close, however it seems to vanish very quickly with a little distance. 2ft away it is barely audible, 3ft it is inadable in a quiet environment but may still be audible in <22Db environments at this distance, longer power cables can easily be used and the USB data cable to shut it down via software can be a maximum of 5M. When it is running off of the battery, the noise becomes far louder, and it is very audible even from 5-6ft away in a noisy environment. Notes: It has no fan, it has 4 power sockets that are battery protected and a further 2 that are surge protected. It also has surge sockets for telephone and network cables. 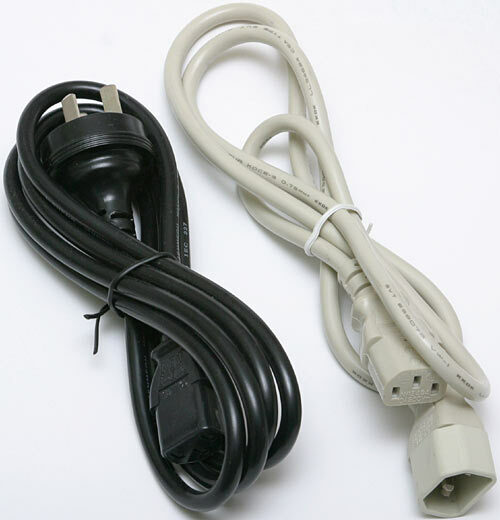 All 6 of the power sockets are female IEC connectors, 2 cables supplied, the cable type on the right of the picture linked below. Uhm, weird, maybe your BR800I unit is defective, electrical buzzing noise is not present in the model Back-UPS Pro 650, and BR800I is the successor of this one. Successors don't always make things better. Sorry I didn't respond sooner, was cut off for a week or so. APFC is mandated in Europe. Correct? PFC is mandatory but it can be passive or active, very cheap PSUs only have passive. Square-waves and active PFC don't play well together. If you don't want buzz, then make sure UPS output is sine-wave. Some UPSs will not buzz when getting power from the wall, but make a racket when powering from battery. For spare parts, contact customer support. It's faster then PM'ing me. Well, the decline of professional civility started with Ronald Reagan and his little funky pronunciations of Massachusetts, like that was a dirty word in and of itselt. Ironically enough his home state contains Hollywood, and we all know what that means. It's hard to believe that just a couple of decades ago pubs and dems would carpool to work together, argue the issues at work, and, at the very least, then actl like rational human beings when the shift was over. Today, in the 21st century, you have eldery (can't use the word mature) bigots behaving like spoiled brats, their mention appears to be Dennis Miller or Ann Coulter. Which leaves me once again with the unanswered question. Who is the democratic equivalent of? The lack of answer implies that the dems don't use hate mongers. I don't know, is that the case? Iâ€™ve missed this thread previously, well; glad I found it because Iâ€™m in the market myself for a silent UPS. Andyb, do you still have issues with the unit? or have you replaced it even? Iâ€™m asking because Iâ€™ve been eyeballing the very same unit. Does anywaone have any experience with the Ellipse? walle, I would be happy to recommend the same unit that I have so long as you are not too close, I have it under a desk about 4ft away from me, and I cant hear it at all. Rinswind, I would not recommend this unit if you are going to be within 3ft of the unit, especially at night in a quiet environment. Long power and USB cables are available, so you could have the unit some distance away if you dont find a more suitable candidate. Ok, thanks for the answer and feedback Andyb, much appreciated. I had a listen to my UPS last night (1-AM) after I had turned my server off. On my hands and knees under my desk, with the UPS 4ft away to my left, my uber-silent PC made the same volume of noise 1-ft away to my right. My PC is very very quiet, utterly inaudable from my chair the UPS can be heard over it from 3ft, a crackly, electrical buzzing. As mentioned before this is not really an issue unless someone is very sensitive to this kind of noise, or they have the UPS within a short distance, or their environment is even quieter than mine. I hope this helps. As far as how much noise my PC actually makes, it is not easy to tell without pro level equipment, but judging by SPCR's reviews on the Nexus fans @5v the answer is <20Db, my HDD can not be heard over the noise of whooshing unless there is a lot of long seeks going on (rarely). To give another perspective I can hear my neighbours hot water being pumped around and their boiler boiling over my PC from 1ft. @CoolGav: could you please tell us if this is the APC Smart UPS that you have? According to the specification, audible noise at 1 meter from surface of unit is 55dBA!!! IMO it's a defective UPS: i expect noise under battery-mode, but there is not reason to make noise under normal condition. My friends, any opinions about this point? My server is now on, which is 6 inches to my right ear, I can barely hear the UPS 4 inches to my left ear. My server is probably in the region of 24Db - 27Db. In that unit the fan is running when the UPS is operating from the battery, when charging the Battery and when the internal temperature of the UPS is more than 36 C."
"For the SURT1000XLI the value is 50 dBA. The fan in SURT1000XLI is running all the time." "There is no silent unit for the range of 1000VA." So I guess this means that if you have your unit fully loaded and manage to keep the internal temperature below 36 C things should be relatively silent? CoolGav you said you could not hear buzzing or humming from it. I guess you weren't listening during a blackout and since it's winter in europe your experience should fit these "silent" conditions right? Another interesting point is that you say your Smart XL 750VA has no active cooling. However APC say the 1000VA variant has some fan and as far as I can tell from the link above the 1000VA and 750VA seem practically identical. I guess the fan is not visible from outside. The distributor for my country said the waveform this one outputs is a "smoothed trapezoid". I guess this means they smooth the sharp edges to make it easy on the PSU. Anyway my Corsair HX520 does not emit any unusual whines while on battery. It is rather light (10.2 kg) however it claims to be able to support the system from my signature for about 40 minutes. It reports a load of 10-17% as I write this post, listen to an mp3 and have my torrent client upload to about 100 connections. I also have my Linksys WRT54GL router supported by the battery.